A man wearing a Santa hat sits on a roof. He’s talking to his ex-girlfriend on a cell phone, trying with feigned cheer to wish her a Merry Christmas. He asks if she’s with her new boyfriend. Yes, she replies, and she’s with her whole family, opening presents. He says, “That’s great, because I have a present for you,” and he saws off his own head so it falls down the chimney into the fireplace. This isn’t a horror movie. It’s a cartoon, filmed in stop-motion animation, like “Rudolph the Red-Nosed Reindeer.” It runs on the Cartoon Network, which is owned by Time Warner. And it’s aimed at children. A 6.8-magnitude earthquake struck off Japan‘s northeastern coast Friday, triggering a 50 cm (20 inch) tsunami warning that was lifted about 35 minutes later. The epicenter of the quake, which hit at 2:36 pm, was off the coast of Fukushima, 20 km below Earth’s surface, the same region where the massive 9.0 magnitude earthquake struck on March 11, followed by the devastating 30-meter tsunami, according to the Japan Meteorological Agency. The agency said there was no damage from Fridays’s quake and the tsunami advisory was lifted after no waves were sighted. Some highways were closed and high-speed bullet trains were halted after the quake, public broadcaster NHK said. Here we go again, this time two spots on the Sun turning toward our planet now that are capable of producing powerful X-Class flares. Two sunspots are now rotating toward the planet over the face of the Sun. 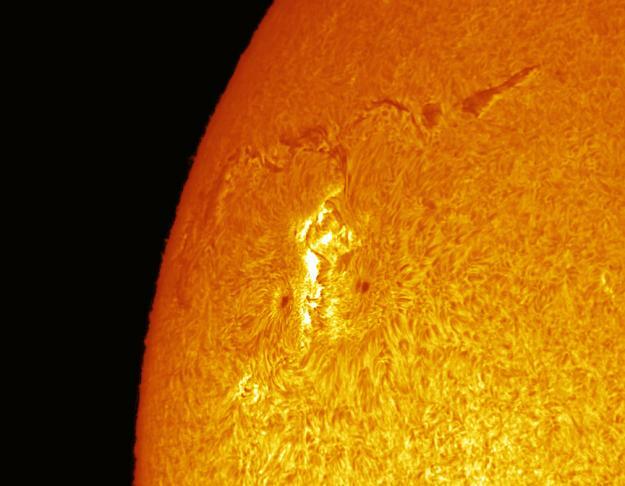 Sunspots 1271 and 1272 remain quiet but pose a threat for X-class solar flares. X-class solar flares are the most powerful solar flare the Sun can produce, according to our planetary scale. These could produce radio and electrical blackouts as well as a brilliant display of aurora if they unleash powerful Earth-directed flares. The last solar storms a week ago were from sunspots on the farside of the Sun now. They are still together and out of our view, Venus was seen in the same field of view as one blasted toward the planet on the far side of the Sun. Stay tuned to the sunspots, it could ‘pop’ at anytime.